Long story short: I wrote a book on conversion optimization, SEO, and related topics, for software companies. You can buy it here (Kindle, iPad, Nook, PDF) or on Amazon (Kindle). For the last couple of years, folks have been asking for me to write about A/B testing, conversion optimization, and whatnot in book form. I’ve never done it, simply because the notion of spending months of work with a publisher to write a book that would (all things being equal) likely fail to earn-out a $5,000 advance seemed to be a silly thing to do just to put “published author” on my resume. I love writing and I like teaching, don’t get me wrong, but writing as a profession always struck me as work, and not even particularly fun work. 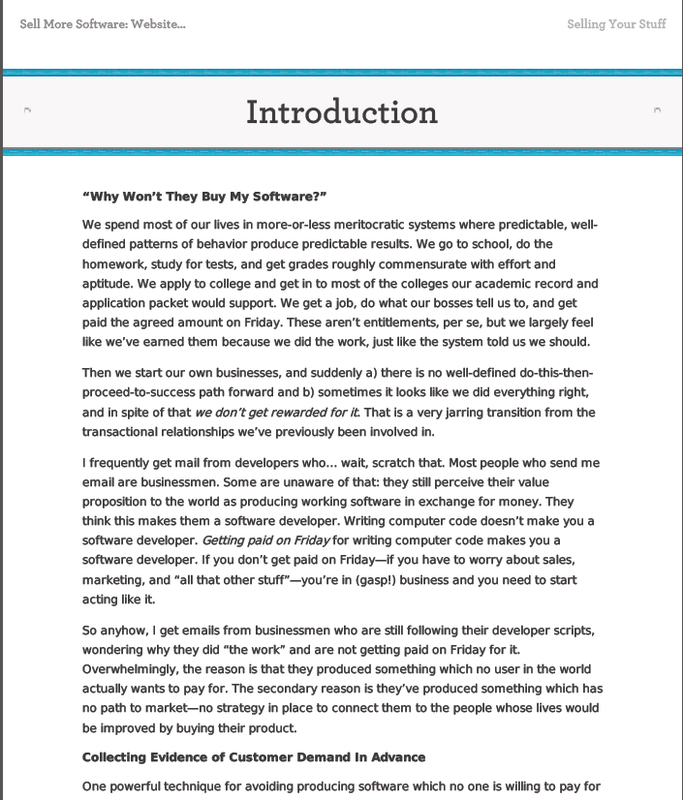 If you generally enjoy my writing and think a curated collection of twenty essays on the topic of making more money for your software business is of interest to you, please buy the book. (It is, as far as I know, $9.99 everywhere you can buy it, but vagaries of the publishing industry mean that I can’t guarantee that this is true for you.) If you don’t want to buy it, don’t worry, I won’t think any less of you — enjoy the blog, come back for more next year. If you buy the book and enjoy it, I’d encourage you to leave a review on Amazon, as folks are really keen on seeing them. Note to other potential authors: the folks at Hyperink are Good People and were a pleasure to work with in the discussion and editing process. If you’ve considered trying your hand at writing a book but, like me, thought the traditional publishing industry is largely toxic and exploitative by construction, I’d encourage you to give them a whirl. P.S. I traditionally post a Year In Review for my businesses, covering what worked and what didn’t as well as statistics, shortly before Christmas. See, for example, 2011’s edition. I will do it again this year, but owing to some bookkeeping hold-ups, it will be shortly after Christmas rather than before. May you and your families have peace, love, and health this Christmas and always.